Knacksteem is a Steem base project, that aims to promote talent, and reward people for their ability. There are several categories for anyone who wishes to contribute can use. Apart from the standard UI and features available on the website, knacksteem also have other components like knackstore. knackstore is still work in progress, yet, for those who don't know knackstore, knackstore is a component of knacksteem where users can trade on their talent, this feature is not completely live on the project website, but I am sure it is one of the project owner top choices. My suggestion to the project will be in line with knackstore, and for better functionality of the project. 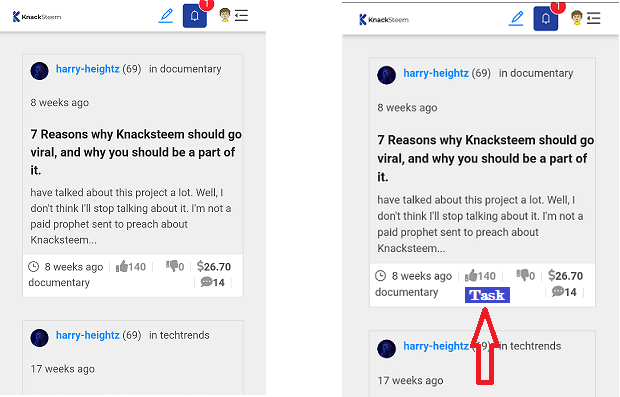 I was just surfing the project website, and an idea snaps into my mind, regarding the knackstore, and how the website interaction could be improved. The project is meant for skilled and nonskilled, the reason why I said nonskilled is that: there are categories which does not need skills to use, such as a documentary. Now, as a user of knacksteem, I may need help on something I cannot do. Several people possess talents that I do not have. E.g Art, music. And for instance, I want someone to create a quality artist picture of my mum for me. The only common way is to write a blog and ask for people help. Which after 7days it get fades away especially if I don't have steem to push it to be visible to the community. Now, I have a better solution. 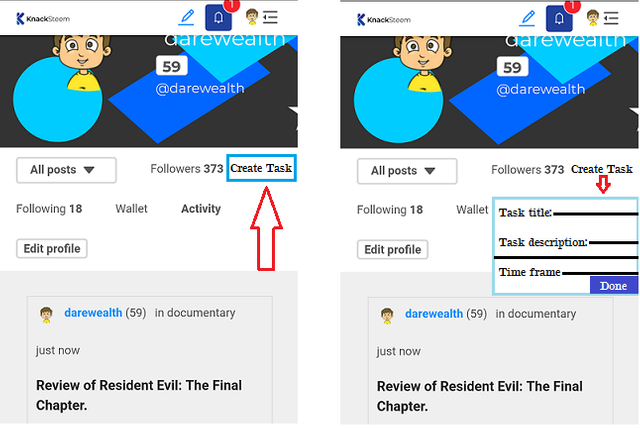 I propose a feature/function which will allow users to indite/pin their tasks on their profile section. If I need help from someone that can draw very well, I will Just create the task on my profile, and wait for someone to contact me. Now you would say what if people did not check your profile? user's that have open task on knacksteem.org. Meaning, if I have a task open, I will have an indicator that will separate me from other people that do not have any task open. And when I get someone to work on it, I will be able to edit/delete it when the task is fully done. I will show the mock up to show how it would look. The image at the right-hand side shows the current view of my profile on a mobile device. The image on the right side shows a button to create tasks. This second image shows when the create task button is pressed, and it displays a drop down menu. 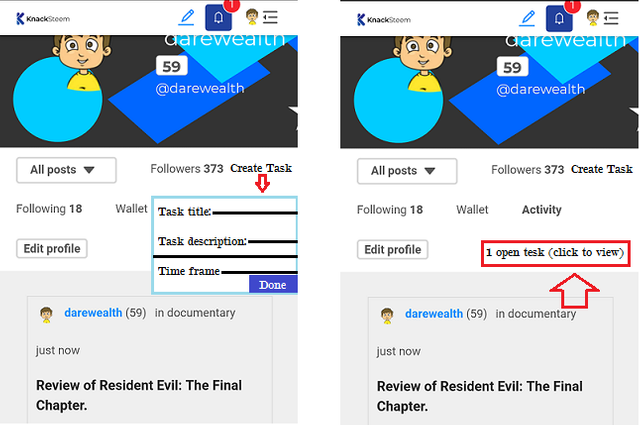 This third set of images show how the task will display on the user profile, and then click to view it will show the description of the task wanted by the task creator, which the person that wants to take on the task will contact the task creator. Image below shows the task indicator for users that have open task on their account. The idea is very useful for quick awareness of open task. There are situations when a user will need someone to work on something he/she wants quickly. This will be a fast way to publish it to the community. Minnows that does not have plenty of steem will also benefit greatly from this idea. Everyone will have equal chances to enjoy the platform since the user has the KNT to pay for the service. I hope to see the feature on the beautiful knacksteem platform. 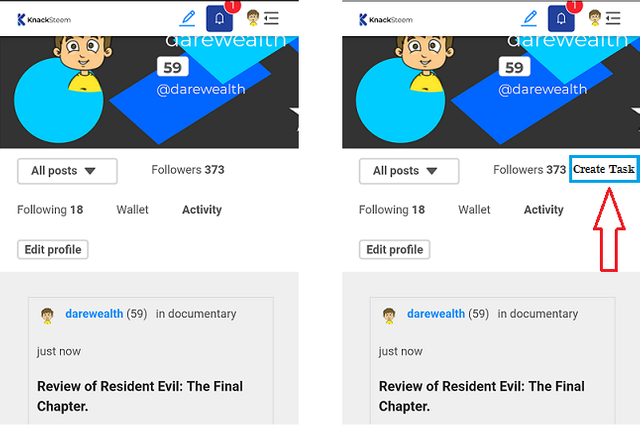 This is another very cool Idea contribution @darewealth. Thanks for supporting the knacksteem project with some valuable ideas. Keep them coming, and we'll try to see them get implemented in the nearest future. Here's your score for this review. Keep it up. You just got a 1.07% upvote from SteemPlus!